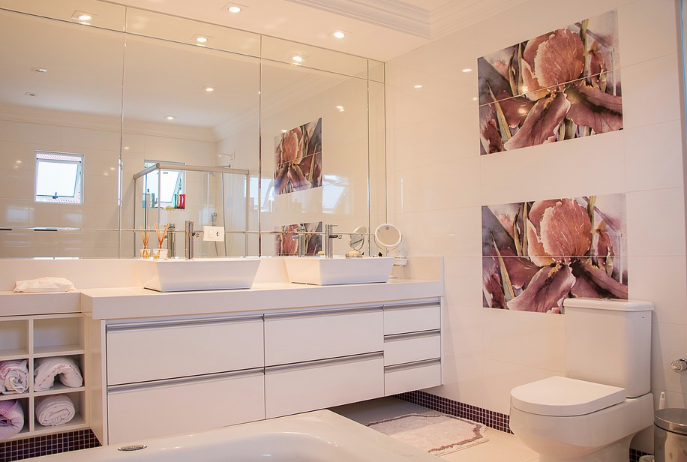 Give considerable attention to your bathroom layout and finish. Your bathroom remodel costs are linked with some key dimensions and common fixture sizes like bathroom vanities. Whether you have a spacious bathroom or an intimate space, create a unique design for your home. Why should you care about the size of your bathroom vanity? Believe it or not, the bathroom remodel cost can vary greatly depending on the size of your fixtures. For example, your choice of lighting, tiling, and even toilet placement can be changed if you choose the incorrect vanity size for your bathroom. Those in smaller urban spaces might avoid having to knock down walls if they purchase a vanity with ample storage space. The right vanity will provide extra aesthetic beauty and practical space for grooming and storage. The wrong vanity size can create a claustrophobic cluttered look or create a messy disaster for your family’s morning routine. 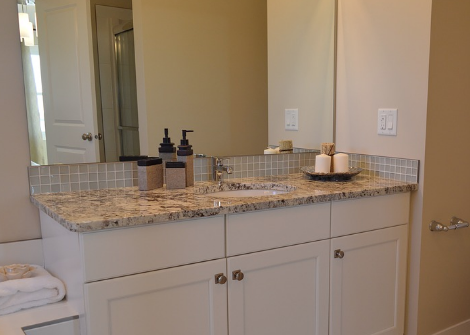 Your vanity sets the right tone for your overall bathroom design. The standard widths for vanities are between one to seven feet (eighty-four centimeters to two meters). The height is typically thirty-one to thirty-five inches (seventy-eight to eighty-eight centimeters). Additionally, measure the vanity countertop if it is separate. The vanity top is an inch deeper and wider than the cabinet. Speak with our professionals about how to measure your vanity properly for your home. Contact us today. We can help you find the perfect bathroom vanity for your remodel. What material is used for kitchen cabinets? Enjoy a broad range of exciting kitchen cabinet materials. 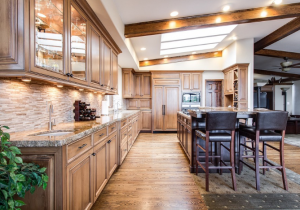 From oak and hard maple to particle board or stainless steel, find the right material for ideal kitchen home interior design. Below are some of the most popular materials for kitchen cabinet design. Enjoy a wide range of natural materials when designing your kitchen. Your home interior design can include oak, hard maple, birch, ash, pine, or even bamboo birch. Oak is another popular choice. Decide which material you want in terms of color, hardness, and durability. Speak with our interior design specialists about choosing the right wood for your custom cabinets. If you want a modern industrial look, design your kitchen with stainless steel fixtures. Both durable and luxurious, stainless steel is a higher priced option for the discerning homeowner. If you are designing on a budget, you may opt for Medium-Density Fiberboard (MDF). MDF is made of small fibers. They have clean edges and a smooth surface. This a versatile option that has more durability than particle board. Particle board is constructed of wood shavings and non-wood plant debris. While very affordable, particle board is one of the least durable options and is susceptible to water. Plywood consists of a multi-layer board made of laminated single plates. There are a few categories of plywood, each with its own uses (such as outdoor versus wet conditions). In fiberboard, fibers are separated from fibrous raw materials and interwoven into a board using adhesives and heat or pressure. These are used for a broad array of kitchen cabinets and can be used for custom cabinetry. 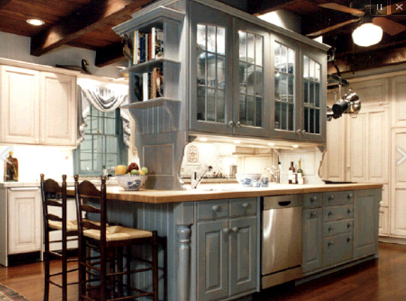 Discuss which materials are best for your kitchen cabinet design today. We would love to hear from you. Call us today. This year proves to be the year of natural looks, minimalism, and sustainability. To kitchen cabinet colors in natural wood finishes to sustainable accessories with an artisan touch, learn the hottest design and home decorating ideas for 2019. What designs work best for your home? While simplicity is in and kitsch is out, bold patterns are coming back to our kitchens. Choose monochromatic kitchen cabinet colors and add a bold backsplash and sleek furniture in bolder darker colors. Graphic tiles are a very popular choice. Don’t forget the value of hidden storage. Hide pots, pans, utensils, and spices with the latest in storage design. Add innovative custom kitchen cabinets to hide the clutter and give your kitchen a clean updated look. Enjoy an oasis in the most-used room in your house. Homeowners tire of cheap plastic furniture and fixtures from big box stores. Instead, they are looking for custom handmade items made of natural or recycled materials. Look for carefully crafted shelving, cabinets, and accessories. Incorporate woodworking into your kitchen design, living room, and even bathroom. Beautiful custom vanities make your bathroom a natural oasis. Gone is the desire for sterile rooms without any texture or color. Instead, mix styles and come up with a new Boho vibe. Curved fabrics and softer lines with a vintage touch are popular. Try a woodwork four post bed with rich jewel-toned comforters. Combine rugs and contrast with the walls. Avoid eggshell white walls and embrace life. Primary colors and graphic shapes have made a return both in artwork and choice of carpeting and accents. Millwork and crafted materials help enhance this connection between nature and humanity. Wood floors, cabinets, fixtures, shelving, and bookcases all help to create an inner sanctum that contrasts vividly with our heavily technology-driven lifestyles. Adding live plants and greenery just adds to this overall connection with our environment. Simple natural bathroom design can be an oasis of well-being. Relax and regenerate in your own peaceful escape. There are many steps to designing your dream bathroom, from selecting the right bathroom vanities and cabinets to installing light fixtures and the right accents. Follow these simple steps to create your own ideal bathroom space. Before you can begin to design your bathroom, you must work around the floorplan of your home. Where does it make sense to install bathroom vanities and cabinets? Where are the bathtub, shower, and toilet located in relation to the mirror and door? Do you have a small space or is it larger? Additionally, think about who will be using the bathroom. Is this a master bathroom or is it for guests or children? You may have to consider options like tearing down a wall or installing new windows to add space to your bathroom. Or you can work with what you have. If possible, try to remove everything that you can from the bathroom to envision the possibilities. Having a blank slate with a new home is often easier than working with an existing floorplan, but any homeowner can redesign their bathroom to make it more beautiful and functional. Work with one of our professionals for an assessment of your bathroom space. A professional will help you decide which types of fixtures, vanities, and cabinetry will work with your existing space. Select customized pieces for odd spaces. Discuss color scheme, finishes, and utility when choosing the cabinets that fit your tastes and lifestyle. Don’t forget the importance of a bathtub and shower in your bathroom. One mistake homeowners make is removing the tub and just installing a shower. Large bathtubs actually add to the resale value of the home, especially for families with small children. While custom luxury baths with jets may not add to the home value, they are very enjoyable by homeowners and add to the feeling of luxury and calm elegance. Finally, select accents like the type of tile, bathroom fixtures, lighting, and accessories that you want to add to your bathroom. You may have to keep the existent tile depending on your budget. However, a tasteful rug or beautiful hanged artwork can minimize ugly tiling. Select towels, fixtures, and artwork that work together to create a natural unique look for an ideal bathroom dream. 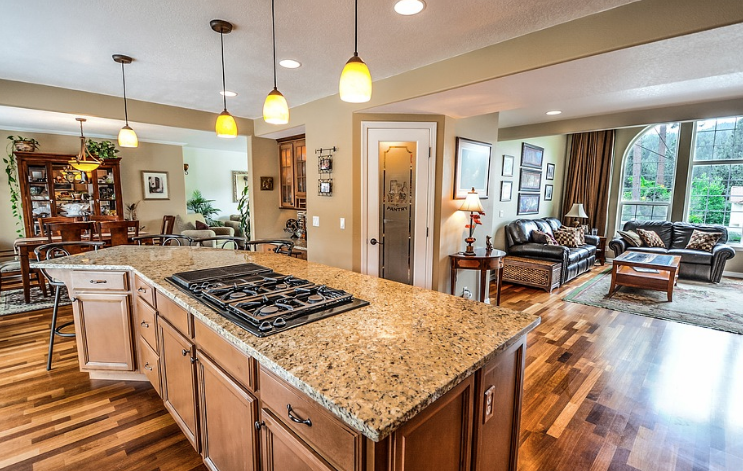 Kitchen remodels are very popular for new homeowners. Home remodeling allows a homeowner to truly take a house and make it into their own unique home. Even seasoned homeowners find that over time a kitchen needs new functionality and updates. 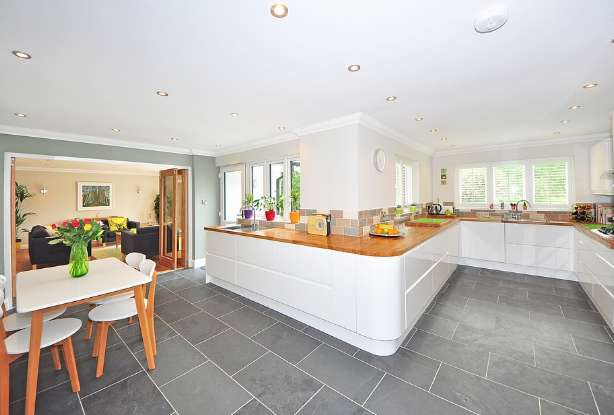 But what are the costs associated with kitchen remodels? How can you calculate these costs? What does a kitchen remodel truly involve? Before you change a single appliance or tear down a wall, be sure that you budget for your kitchen remodel. Why? Home remodeling has many hidden costs from actual materials to labor costs. Additional problems can surface while remodeling that can lead to more costs. Because of this, it is important to know from the outset how much you plan to spend. Low-end renovations can start from fifteen thousand dollars and run up to six figures for high end builds. Your budget should depend on a few factors, including how long you plan on living in the home and what you need versus what you want. For example, if you need the kitchen to be accessible for someone with limited mobility that should take precedence over a higher end refrigerator, which might be nice but won’t add that much functionality to your space. Also, if you are only renovating to resell in a few years, you might want to avoid expansive renovations. For families planning to stay in their home for more than five years, keep your family’s needs over time in mind. You want to consider the length of the project, the location of your home, the weather, and if you plan on doing any of the work yourself. Do you need to buy new cabinets or appliances? Do you need to tear out a wall? Factor all of these into your budget. Unlike simply repainting a bedroom, a full kitchen remodel involves work with plumbing, electricity, and demolition that is usually best for professionals. Depending on the extent of your remodel, you also might need an architect, who charges an average of over one hundred an hour. What materials should you use? Speak with a professional about options available to you. If you are interested in resale value, be careful about what you choose. Some materials, while luxurious, may not add significantly to the resale value of your home. While updating your kitchen will inevitably increase the value of your home, especially if you are taking a very dated space and modernizing it, taking an average kitchen into the space age might cost more than the resale value. Remember how long you plan to live in the home when factoring in materials, which can make up about eighty percent of the total cost of the project. Call a professional today about your upcoming kitchen remodel for the most precise estimate for your home. They can help you find the perfect design that meets your needs. Home design trends are constantly changing. Custom cabinetry remains one of the most popular ways to create a unique look in your home at an affordable cost. From modern bathroom vanities to custom pantries, open up space and create a beautiful design with cabinets engineered with you in mind. Let’s look at some of the top trends from this year. Modern bathroom vanities add a sleek elegant design and unique simplicity. Providing both storage and timeless beauty, these designs are both versatile and sturdy. Custom cabinetry can maximize space while working around unusual features in your bathroom. Choose the right color and finish to accent your home décor. Speak with an interior designer about finding the right look and model for your unique style. Your kitchen is truly the heart of your home. 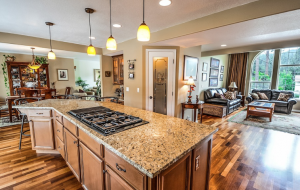 A gathering place each day for family and friends, as well as a place to congregate during parties and the holidays, the kitchen deserves the royal treatment. Yet many homeowners are trapped by the original cabinet design and layout of the kitchen. No more. Revamp your home and open up the room with customized kitchen cabinets. You can design a pantry that meets your needs, nifty little corners for knick-knacks and kitchenware, and even add a breakfast nook. Include space for your cookbook collection and bright lighting for a finished look. Many homeowners work from home. The importance of a quality spacious home office has become a keen selling point for many homeowners. Design an office area that has custom cabinets that both provide more than ample organization but also have sleek elegance. Hideaway cabinets can store important papers, your laptop, or unsightly printer. Choose a style that suits your unique tastes. Custom cabinets provide homeowners with an easy and affordable way to add functionality and elegance to their home. Renovating and updating a space with cabinetry will increase your homes worth over time. Speak with a professional today about your unique home design.